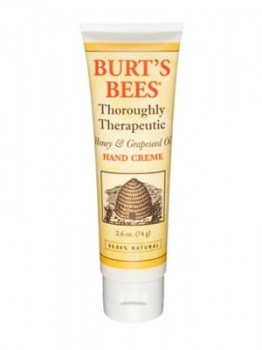 Burt's Bees Honey and Grapseed Oil Hand Cream is a little miracle worker for dry, cracked and overworked hands. Burt's Bees Honey and Grapseed Oil Hand Cream is a natural hand cream that provides daily therapy for extremely dry hands using some of nature's most moisturising agents, such as honey, jojoba oil and rosemary extract. Burt's Bees Honey and Grapseed Oil Hand Cream helps you to reveal hands that are naturally soft to the touch, smooth and healthy.